In the 1650 edition of his book Hesperides, the English poet Robert Herrick included this short poem. It is surely the single greatest sporting achievement of all time. The man could barely stand. His left knee was like tangled spaghetti. His tibia was fractured in two places. Yet Woods beat the world’s best standing on one leg. Q. At the Vantage you said you were pain-free for the first time in a long time. Is that still the case? RAYMOND FLOYD: Absolutely. I am now taking just my three Advil a day and that is terrific. Are you popping Ibuprofen or Aleve just to keep participating? You know it’s not good for you. . . . Now with Flexcin, there’s an alternative that is permanent! Try Flexcin and become active again. 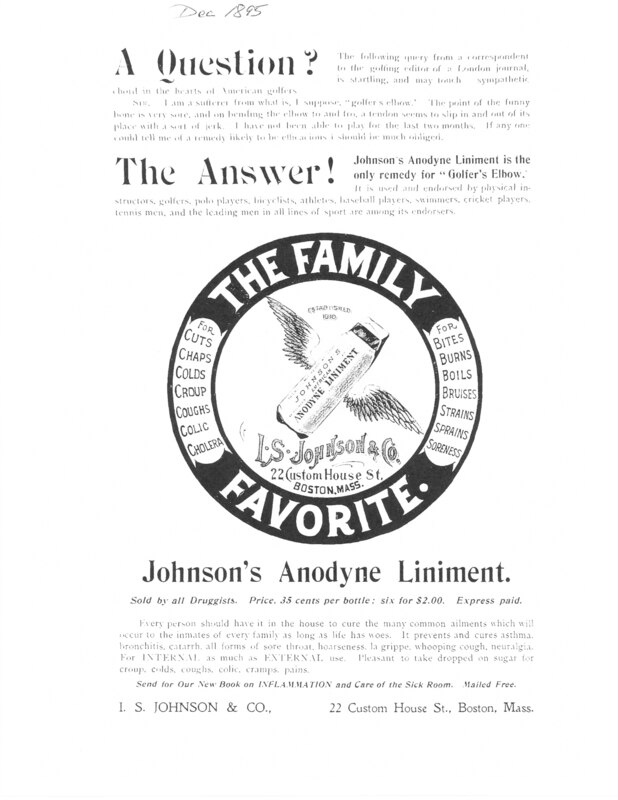 Golfers who played over 100 years ago and read The Golfer magazine (10 cents an issue, a dollar a year), were regularly regaled with ads, some of them in verse, for Johnson’s Anodyne Liniment (that also targeted “golfer’s elbow” as in the ad above). (See an earlier Post for details.) Now I have found that Johnson’s went even further to promote its product. The April 1898 issue of The Golfer included a full page poem by an anonymous poet, which can only be described as an unabashed endorsement for Johnson’s Liniment! This “epic poem” matches “Grim Pain” against “The Knight of the Links.” Read on (preferably out-loud) to find out who this heroic Knight was. With bruise “Golf arm” and aches by the score. Apparently Johnson’s lived on for many years. However, in 1932 its advertising claims were found to be fraudulent by the Food and Drug Administration. The Knight was finally stripped of its armour. A minute while I meditate. This isn’t easy. Ah, I’ve found it! A cookie with a hole around it. Taking Wilbur’s idea as a starting point, I wrote two golf “opposite” poems. What is the opposite of club? It might be ball, but there’s a rub. The opposite of club is muff! The opposite of away is last!